When you log in to Your Health Alliance, under the Individual tab where your clients’ names are displayed, you will now see a colored bar under each name with an amount shown. Blue bar: Current amount due (including $0 if already paid). Red bar: Past-due balance. The total amount due is shown, and some portion of that is at least 30 days overdue. Select “View Invoices” for a client with a red bar to see what portion of that amount is overdue and what the current balance is. 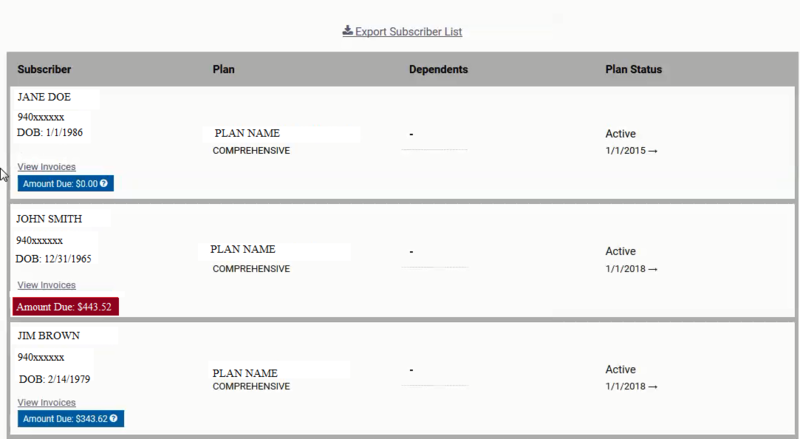 You can also export a subscriber list from your results. For example, you can filter results to see only subscribers with past-due amounts, and then export that list to an Excel file that you can save. Please email BrokerServices@healthalliance.org with any questions.